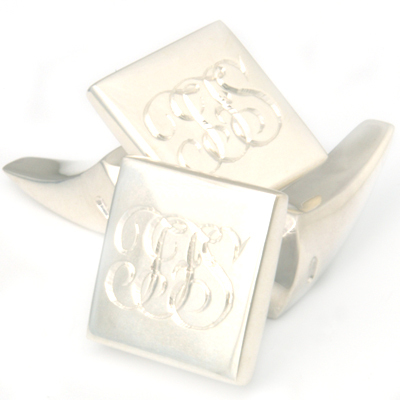 Silver ‘Signature’ Engraved Tooth Cufflinks — Form Bespoke Jewellers Ltd. The bespoke ‘Signature Range’ has been designed to provide that extra unique edge to any outfit. Have your initals (or almost any design!) hand engraved onto your cufflinks to make them perfectly bespoke to you. In today’s fashion-conscious world we appreciate that, male or female, appearance matters. That’s why we’ve created a versatile collection of cufflinks consisting of four distinct ranges, which we believe are the ideal male accessory. As ever the collection gives you the opportunity to personalise your purchases so you can really stand out from the crowd. We’ve created four different ranges for you. The choice is yours, with the freedom to be as creative as you like at no extra cost. Each set of cufflinks comes presented in a striking silver chrome box, and includes our standard after care promise package. These cufflinks are available now and have the potential to make fantastic gifts for any occasion.